46 Commonwealth is located on the south side of Commonwealth, between Arlington and Berkeley, with 44 Commonwealth to the east and 48 Commonwealth (255 Berkeley) to the west. 46 Commonwealth was built ca. 1864 as the home of dry goods merchant and railroad investor Samuel Henry Gookin and his wife Frances Elizabeth (Sistare) Gookin. They previously had lived at 240 Shawmut. Samuel Gookin acquired the land on which 46 Commonwealth was built on October 12, 1863, from William Chadbourne, who also owned the lot at 48 Commonwealth where he built his own home. Both lots had originally been part of a larger tract of land purchased from the Commonwealth of Massachusetts on May 2, 1860, by shipping merchant and US Congressman Samuel Hooper. He and his wife, Anne (Sturgis) Hooper, lived at 27 Commonwealth. Click here for an index to the deeds for 46 Commonwealth. 46 Commonwealth may have been designed by architect John Roulstone Hall. His January 13, 1911, obituary in the Boston Globe indicates that in 1859 “he designed a house for William Chadburn [sic] at Commonwealth av and Berkeley st., costing $100,000.” The year is clearly incorrect, inasmuch as the land had not even been sold by the Commonwealth in 1859, and the cost appears high. However, given the precise reference (which was repeated in his obituary published the same day in the Boston Herald) it seems likely that he did, in fact, design 48 Commonwealth. If so, it is also possible that he designed 46 Commonwealth, given the close similarity of design and contemporaneous construction of rhe two houses. 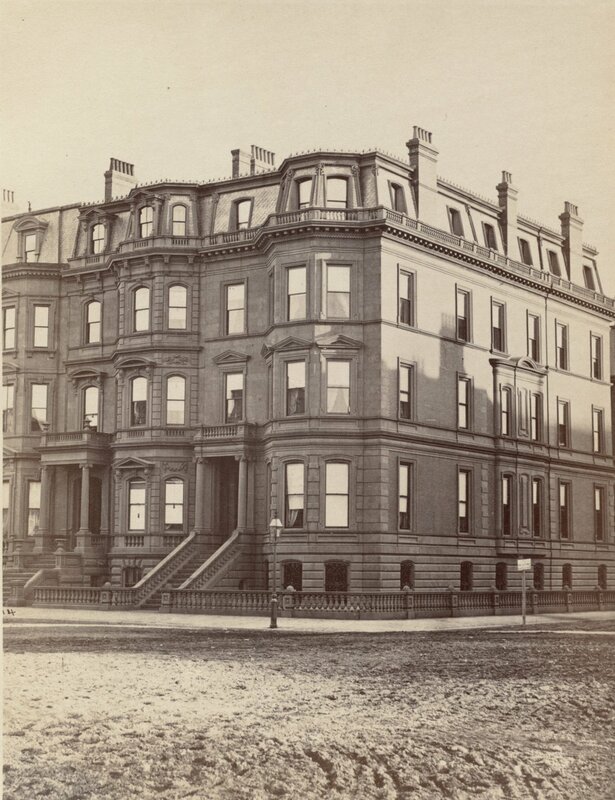 In November of 1865, Joseph Huntington White purchased 46 Commonwealth from Samuel Gookin, and Samuel Gookin purchased Joseph White’s former home at 128 Boylston (on the south side, between Arlington and Berkeley). 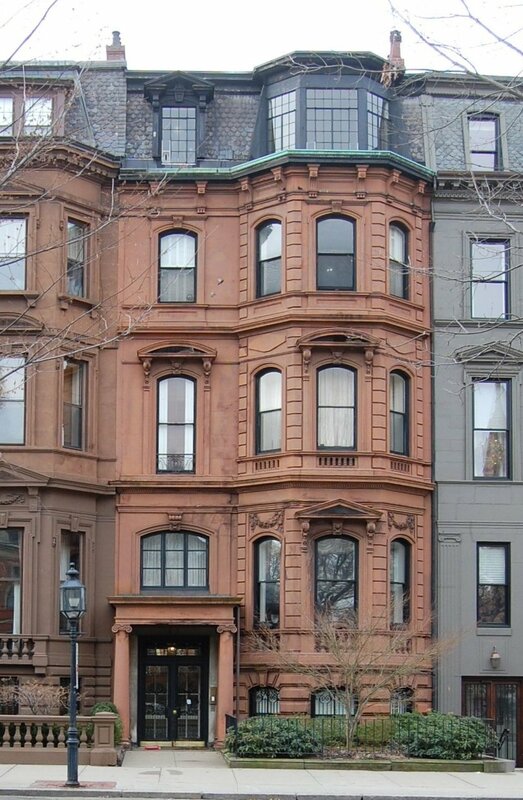 The Gookins moved to 128 Boylston; by 1872 they were living at 12 Commonwealth. Joseph White and his wife, Ellen Danforth (Tewksbury) White, made 46 Commonwealth their Boston home. They also maintained a home at 535 Boylston in Brookline, overlooking the Boylston Street Reservoir. Joseph H. White was a dry goods importer and wholesale merchant. In 1873, he reorganized the Manchester Mills (in New Hampshire) and his firm, White, Payson & Co., subsequently became the selling agents for the mill. He also served as president of the Eliot National Bank. Joseph and Ellen White continued to live at 46 Commonwealth in 1882, but had moved to their home in Brookline by 1883. By the 1882-1883 winter season, 46 Commonwealth was the Boston home of Frank Morton Ames and his wife, Catherine Hayward (Copeland) Ames. Frank Ames’s family had founded the Ames Shovel Company in North Easton and later became major investors in the Union Pacific and other railroads. Frank Ames was owner of the Kinsley Iron and Machine Company in Canton (where Frank and Catherine Ames also maintained a residence), a railroad investor, and owner of a 12,000 acre plantation on the Mississippi River. 46 Commonwealth was owned by George Kuhn Davis, who had purchased it from Joseph White on April 1, 1882. He was private secretary to Frank Ames’s brother, Oliver Ames, who served as Governor of Massachusetts from 1887 to 1890. George Davis and his wife, Anna (Chase) Davis, lived in North Easton. He committed suicide in November of 1893. On March 7, 1892, George Davis had transferred 46 Commonwealth Frank Ames. The deed was not recorded, however, until October 15, 1902, and George Davis’s heirs are shown as the owners of 46 Commonwealth on the 1895 and 1898 Bromley maps. Frank Ames died in August of 1898 and for about the next two years Catherine Ames lived in North Easton. 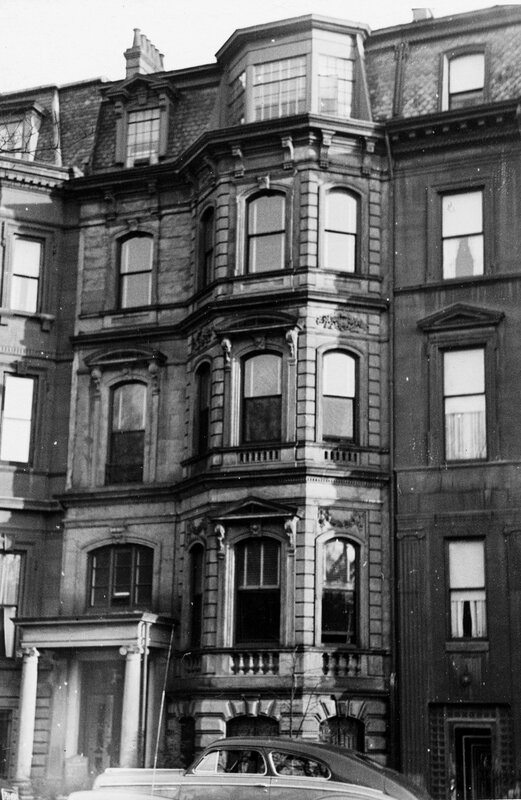 During the 1898-1899 and 1890-1900 winter seasons, 46 Commonwealth was the home of insurance broker William H. Brewster and his wife, Gertrude A. (Balch) Brewster. They had lived at 32 Wales in 1898. Living with them in June of 1900 (at the time of the US Census) were Gertrude Brewster’s sister, Edith (Balch) Sweetser, the widow of Moses Foster Sweetser, and their son, Arthur Sweetser. Moses F. Sweetser was an author and editor; he had died in July of 1897. 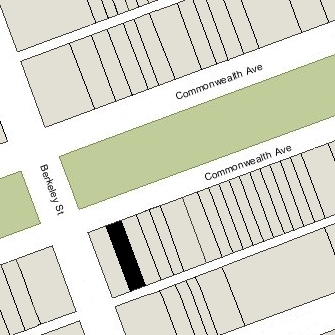 By 1901, the Brewsters had moved to 132 St. Mary’s Street and Catherine Ames had resumed living at 46 Commonwealth. On October 15, 1902, 46 Commonwealth was purchased from the Frank Ames estate by Maria Theresa Burnham (Dodge) Hopkins, the wife of Amos Lawrence Hopkins. At the time they purchased 46 Commonwealth, the Hopkinses were living at 84 Commonwealth with her mother, Maria Theresa Appleton (Burnham) Dodge, the widow of Nehemiah Dodge, Jr. The Hopkinses and Mrs. Dodge moved to 46 Commonwealth by the 1903-1904 winter season. Amos Lawrence Hopkins was a railroad investor and officer, affiliated with the Jay Gould organization until 1889, when he retired to Williamstown (where he had been born) and acquired extensive land holdings. He returned to the railroad business in the 1890s and became President of the New York, Susquehanna, and Western Railroad Company, and receiver of the Chicago and Northern Pacific Railroad. Maria Theresa Dodge died in April of 1910 and Amos Lawrence Hopkins died in April of 1912. Theresa Hopkins continued to live at 46 Commonwealth until her death in October of 1935. She also maintained a home in Nahant. The house was not listed in the 1936 and 1937 Blue Books and was shown as vacant in the 1937 City Directory. On April 20, 1937, 46 Commonwealth was purchased from the estate of M. Theresa B. Hopkins and from the Episcopal Diocese of Massachusetts and Massachusetts General Hospital, the residual devisees under her will, by Elizabeth Pennell of Portland, Maine. The next day, on April 21, 1937, it was acquired from Elizabeth Pennell by Harold Louville Niles and Marion H. Niles, trustees under the will of Louville V. Niles. 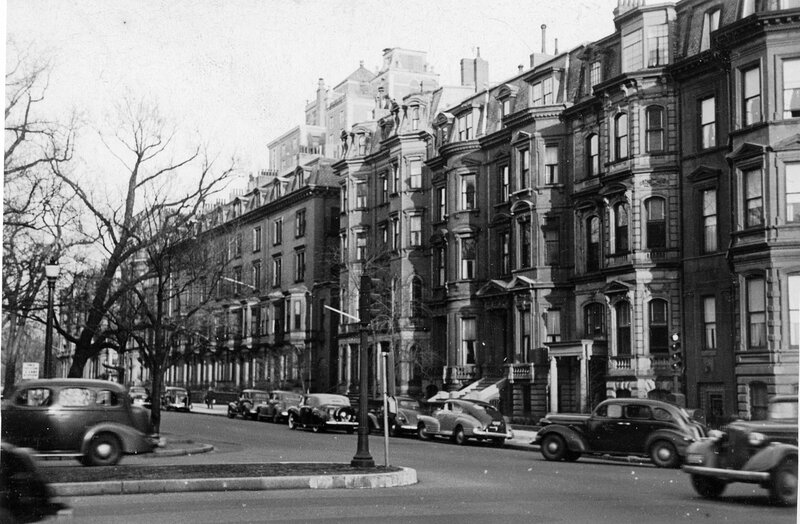 The transaction was reported by the Boston Globe on May 13, 1937, which noted that the purchaser would “remodel into high-class apartments.” Harold Niles was a real estate dealer and property manager. In May of 1937, Niles Management, Inc. applied for permission to convert the property from a single-family dwelling into twelve apartments, including lowering the front entrance to street level and adding a sixth floor. The remodeling was designed by architect Edward B. Stratton. Plans for the remodeling, including elevations and floor plans, are included in the City of Boston Blueprints Collection in the Boston Public Library’s Arts Department (reference BIN P-147). Niles Management subsequently abandoned the proposal to add the additional story and in June of 1938, the Board of Appeal approved conversion of the property into ten apartments. On July 31, 1945, 46 Commonwealth acquired from Harold Niles and Marion Niles by Earl Spickett Clark. He and his wife, Muriel Borden (Nicoll) Clark, lived in Arlington. Earl Clark died in January of 1951, and on April 1, 1951, Muriel Clark and their son, Clarence Leslie Clark, as successor trustees of the Rockwood Trust, transferred the property into their own names. On September 12, 1952, 46 Commonwealth was acquired from Muriel Clark and Clarence Clark by the Kirby Realty Corp. Ralph Edmund Kirby was president and treasurer of Kirby Realty Corp. He and his wife, Mary Elizabeth (Caseau) Kirby, lived in Wellesley Hills. Ralph Kirby died in June of 1967. On September 30, 1968, the Kirby Realty Corp. transferred the property to Mary Kirby, who had succeeded her husband as president and treasurer of the company. On August 25, 1978, she converted the house into ten condominium units, the 46 Commonwealth Avenue Condominium.